January is value season in Orlando. The spectacular attractions at Disney and the many other major theme parks can be enjoyed without having to endure the long lines and stifling heat of Orlando's summer months. Join Perkiomen and take advantage of winter deals! Visiting Orlando in the off-season can save you time and money. Whether it's a white-knuckled thrill ride, exciting round of golf, mega shopping junket or a movie theatre performance, Orlando and the surrounding Central Florida region is a perennial favorite destination among vacationers. So, when the winter chill sets in, come bask in the Florida sunshine. Please be aware that due to the length of the bus ride while traveling straight through to Orlando, we ask that you not bring children under the age of five. Today we depart for Florida in the late afternoon and drive through the night to ensure that you have more than enough time to explore the great city of Orlando! We will have dinner and rest stops along the way, as well as a breakfast stop on Monday morning. We arrive in Orlando by late morning and head straight to the Rosen Inn on International Drive, the location of our lodging for the next four evenings. 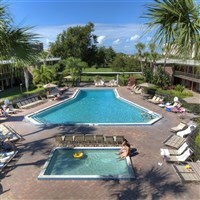 The Rosen Inn has a restaurant, café, lounge, outdoor heated pools, gift shop, arcade and business center. They provide free transportation to Universal Studios and Sea World. A guest service desk is available to help with admission tickets and transportation needs. The I-ride Trolley, shopping and restaurants are all within walking distance. Please note: Your hotel room will not be available until 4:00pm; your luggage will be stored for you. You have 3 full days in Orlando to enjoy at your leisure. - 1 morning shuttle and 2 evening shuttles will be arranged to and from the Disney Transportation and Ticket Center to enable you to travel to the Disney theme parks including Magic Kingdom, Epcot, Animal Kingdom, Universal Studios or Downtown Disney with a choice of public transportation options. You will have access to Disney's four major theme parks. The Magic Kingdom features timeless attractions, such as the Hall of Presidents. EPCOT, which consists of Future World and the World Showcase, not only features educational and fun rides, but world class restaurants right within the park. Experience the magic of movies at Hollywood Studios. And be sure to visit Disney's Animal Kingdom, one of the largest animal theme parks in the world. Theme parks not your thing? There is still fun to be had in Orlando. Shop, browse and dine at Disney Springs. There is a movie theater, specialty shops and many dining experiences like the House of Blues, Wolfgang Puck, Planet Hollywood, T-Rex & the Rainforest Café. Universal's CityWalk offers a variety of shops and boutiques where you can pick up a souvenir for yourself or the folks back home. Themed restaurant options allow you to listen to music and dine on specialty items at NASCAR Sports Grill, NBA City, Jimmy Buffett's Margaritaville, Emeril's and Bubba Gump's. With all of the restaurant options you will never run out of places to eat. During the day play miniature golf at one of Orlando's amusing courses or hit the links at one of the many outstanding public courses in the area…sand traps are not as bad when they are shaped like Mickey Mouse! Today is your last day in Orlando, so enjoy and take in the sights you missed or revisit the ones that you loved. We will depart for home this evening at 7:00 pm, and drive through the night. We will have rest stops, as well as breakfast and lunch stops on Saturday. Please note: Hotel check out is 11:00am; your luggage will be stored for you. Arrival home is scheduled for mid-afternoon, with many memories of your fun in the sun!